The Attic, Virtual Intrument Bundle from Soniccouture. Soniccouture asked producers Neil Davidge, Adrian Utley and Liam Howe to have a look in their attic, where they found several old analog synthesizers. The brand then sampled these instruments and modeled their characteristics (oscillator drift, attach variation, custom chorus, ensemble effect, legato, mono mode…). An effect section with reverb, phaser, chorus, delay, compression, EQ, filters, amp models and overdrive was also added. The result is The Attic, a 7.9GB (NCW compressed format) library for Kontakt, featuring 350 presets. The samples of the 10 instruments have a 24-bit / 44.1kHz stereo resolution. The library has a regular price of 129€ but until May 2nd, you can get a 20€ discount using the coupon code URR3K3Y. Plus, if you own the original versions of Synth AKS, Philicorda or Omnichord (which were updated in this bundle), contact Soniccouture and you can get up to 40% discount. 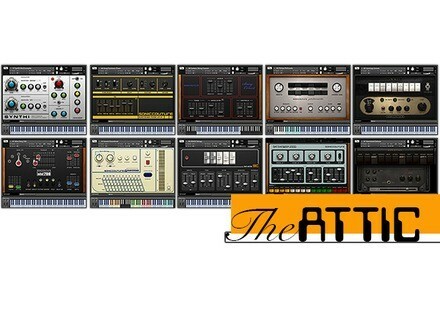 Note that The Attic is compatible with the Free Kontakt Player. -50% off the ChannelStrip mk2 for 48 hours HorNet launched a few hours ago a 48-hour flash sale with a 50% discount off its ChannelStrip mk2 plug-in. The Xils 3 synth updated to v2 Xils Lab has updated its emulation of the EMS VCS3 synth and EMS 256 sequencer to version 3.2. The Circle virtual synth now in 64-bit Future Audio Workshop announces the release of the 64-bit version of its Circle virtual synth on Mac OS X and Windows.